If you’re looking for a strong but flexible rope with a good fatigue life, you might want to consider our 6×36 wire core galvanized steel rope. 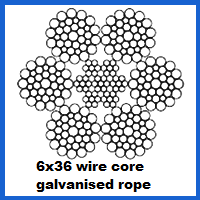 Our 6×36 wire core galvanized steel rope is made up of 6 strands with 36 wires per strand. This greater number of strands per wire ensures the rope has an excellent fatigue resistance albeit with a slightly lower crush resistance. Due to its flexibility this rope has an incredibly varied range of uses. Typically used in the lifting, winching and crane industries. It can also be used for wire rope rigging applications. The independent wire rope core provides the rope with more strength and durability than a 6 x 36 wire rope with fibre core. This in turn allows the rope to be flexible whilst still maintaining a high breaking strain. 6 x 36 ropes with a wire core are much less susceptible to crushing and this risk can be further minimised by using well designed sheaves and grooved drums. The rope has an individual W.R core which enables it to have a higher breaking load, and used most often in general engineering practices. This wire-rope has an equal lay construction where all of the wires & strands have the exact same length of lay, formed in a single operation and forms a compact strand of high metallic content giving it its superior breaking load. The 6×36 W.R is available in diameters from 8mm – 76mm, and is most often used for:- Wire-rope slings, crane ropes, electric hoist ropes, tow ropes, winches, pursing wires, mooring ropes, wire-rope rigging and life boat falls etc. Here at Rope Services Direct we supply 6 x 36 core construction wire in a wide range of diameters. Whether you need holding rope for cranes, winch rope or hoist rope, our 6 x 36 rope can fulfill all of these requirements and more. To order your rope, simply fill out a rapid enquiry form here. For further information or to ask for expert advice, please call us on 01384 78004. 6x36 Wire Core Galvanized Steel Rope Overall rating: 5 out of 5 based on 6 reviews.